This is the 1,000th post on EDM Assassin. It is a real busy day for announcements of tracks and news since Miami Music Week starts in exactly one week. One week until the start of Festival Season. I wanted to take the time to thank you, the viewer and the listeners because if it were not for you, this site would not exist. 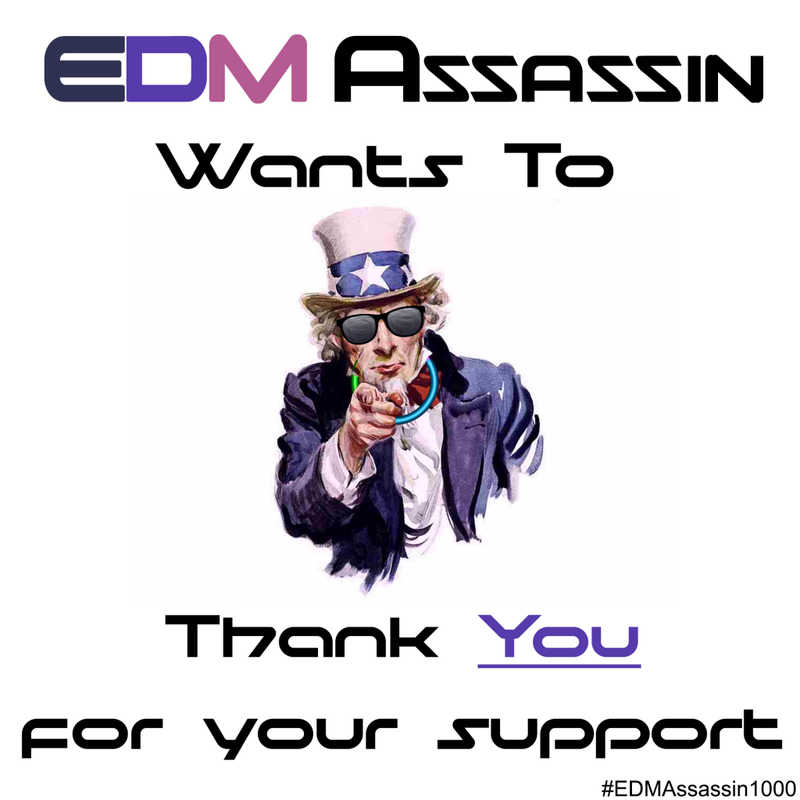 Every day, we here at EDM Assassin look to do bigger and better things. We strive to improve the quality of the site for your satisfaction. It was about 4 months ago (almost to this very day) that I re-opened the site with its new look and outlook. You graciously welcomed the site and praised us. That meant the world to us. Since our re-opening, we have focused on the up-and-coming artists. We get submissions almost daily to post on the site. Just about every-single-submission has been posted because we like them all. Since that November day, we have increase from just myself writing to having 5 part-time writers including articles about EDM that they enjoy most! We find that to be a huge accomplishment to have others share our dream. Just about 2 months ago, I tweeted about wanting to start a podcast. Shortly after that tweet went out, the inception of Backstage with the EDM Assassins began. I, originally, was supposed to be only a part time host, but because I enjoy my fellow hosts quite a bit, I bought some good equipment (which I am still working on improving) and became a full time host working weekly to get you the latest episode. YOU; the viewers who read our site through loyalty of loving the site, through one of our social media sites, or through Reddit. I can’t explain how much we appreciate it. YOU; the listeners who listen to our podcast week in and week out. We are constantly working hard to put on a better episode than the prior week. We work hard for you. Jimmy;You don’t leave your room. You don’t even visit the site you made anymore. You don’t contribute. You’re “busy” but damnit, you’re the reason this site exists. If it weren’t for you in the beginning, this site would have never existed. So, thank you.